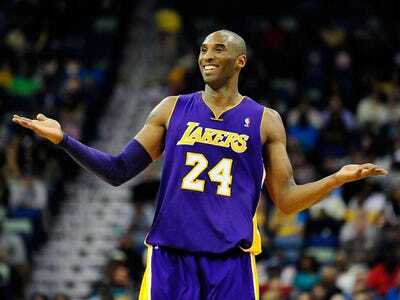 Kobe Bryant is the NBA’s highest-paid player with a salary this season of $US23.5 million. But thanks to taxes he will only take home a little more than half of that according to Chris Johnson of SI.com. Johnson, working with tax expert Robert Raiola, looked at the highest-paid players in the NBA and came up with an estimate of each player’s taxes, considering such factors as where the player resides and where the player plays both home and road games. The road games are important for calculating the so-called “jock tax.” This is a tax levied by some city and states on individuals who visit the area for work. Typically, these taxes are only forced upon pro athletes whose work schedules and salaries are easily obtainable. Here are the five players that are expected to pay the most in taxes this season along with their estimated taxes (salary in parentheses). Bryant may not actually be the NBA’s highest-paid player after taxes. Bryant’s estimated take-home pay is $US12.1 million or about 51.5% of his salary. Meanwhile, Joe Johnson of the Brooklyn Nets will take home an estimated $US12.5 million (53.9%) of his $US23.2 million salary, making him the unofficial highest-paid player in the NBA.